Now we know. No—that’s not right. Now we think we know Jones’s master plan, and we think we know his motives (basic megalomaniacal world destruction, with animal accompaniment). What matters more, however, is the damage he has caused. Not earthquake damage, although of course that is significant, but damage to the sense of community that has, for the past few episodes, been growing between the two worlds. This season has not focused on Over There quite as much as I would have liked, but that made the Over There episodes all the more interesting for their rarity. Seeing that world felt like chancing upon an old friend in an unexpected place. That Over There made Lincoln “Clark Kent” Lee feel tethered made it all the more interesting of late, as Lincoln seemed to be thriving in his new environment. Hooray! Alas, I hoorayed too soon. The loss of Over There, including our loss of Lincoln Lee, feels like finding out that an old and beloved (although seldom-seen) friend has died. I will miss Walternate, Fauxlivia, Other-Astrid, and—above all—Lincoln Lee. I will miss making jokes about coffee shortages. And I will miss they way the two universes played off of each other, with each character learning something about themselves and their potential from their doppelganger. This season began with a profound sadness, which Olivia described as a “hole in her life.” There’s an Over-There-shaped hole in Over Here now, and vice versa. The destruction of the bridge, and the removal of our other set of heroes, almost could have been a season finale (although that would have been even more upsetting). It feels like Fringe is winding down, shucking off the extraneous bits to make the final showdown of this season more tense and taut. Nonetheless, I hope this severance is not permanent. Regardless, Jones’s plan is provocative in its simplicity. Destroy two universes in order to create a Big Bang presided over by him, on a tiny “island” with a bunch of creepy animals. Why would anyone want to do that? What would the results be like? Walter’s delightful slides made the world-smooshing seem like Big-Bang levels of chaos. Who can rule that or thrive in it? How much power does Jones even have? The return of Nick Lane from Season One’s “Bad Dreams” was interesting and fascinating: Olivia remembers him now, even though he recognizes her only from childhood. He seems to have thoroughly bought Jones’s disinformation. His story about his sister Kendra was heart-breaking, especially since it was implicitly contrasted with Over-There Nick, who mentioned that Lincoln had dated Kendra. O-T Nick said her name with such ease that I assume Kendra is still alive; that would make sense, as her death was a result of Bell’s and Walter’s experiments and their effect on Nick’s latent reverse-empathy. Subtle heartbreak: Fringe does it so well. Now that we know Fringe will have a 13-episode fifth season, I have more confidence in this season. Sure, it might end with a dud, and Jones’s plan is still weirdly sketchy. But 13 episodes and a solid end-date gives the writers a chance to go out with a bang, to tie up loss ends, and to make sure that everything winds up with rainbows, puppies, and red licorice growing from trees. Because that is how this will end. Right? • Walternate: “If I have learned one thing, it’s that anything is possible.” There is something oddly solipsistic about being validated by one’s counterpart, isn’t there? • Walter: “Oh, she’s pretty.” Interesting callback to last week’s episode. • Great shot of Lincoln in a mirror when he was talking to Peter. • While all the counterpart conversations were wonderful, Walter and Walternate in the bridge hallway was the best. Other-Astrid’s small wave is a close second, though. 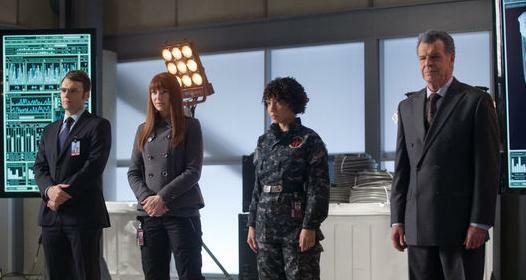 • Did anyone else wonder if the Fringe teams would get re-ordered as the bridge was destroyed? Other-Astrid Over Here, for instance, and the Walters swapped? • My DVR insists that this episode is called “World’s Apart.” As I cannot make heads or tails of that apostrophe, I have decided to remove it. Always look forward to your review...well done! I cried last night which I normally do not do during a Fringe episode but seeing and hearing the conversation between the two Walters was more than I could handle. And loosing Lincoln sent me into a crying fit. Beautifully written episode and beautifully written review of this amazing episode. And in response to the review - Jones wanted Alt-Broyles to place a device on the machine that would collapse both universes (according to Walter), which is the same end to which the Cortexiphan subjects were working towards. It's possible that this was his Plan B, and AltBroyles placing the device on the machine was his Plan A. Did anyone remember last week's episode?I think that why the other universe wasn't even mentioned once-because the bridge was severed in this ep! And the promo for next week mentions Bell, so it might mean the whole future stuffs that happened last week,will eventually come true-in season 5!! I did not cry, but felt sad to see Lincoln, and alt Astrid, Walter and Olivia disappear. Great episode, and wonderful review. I liked how the anger that Walternate had held towards Walter by the time of Worlds Apart had turned into sympathy. It was an "I'll miss you too, scarecrow" episode end to be sure. I'm a big fan of the show and science fiction in general but come on! Jones wanted to collapse both universes to cause another big bang and create a new universe in which he would rule? Really? Even for science fiction that is way over the top! I guess Jones must be immortal if he can wait millions of years for the a new universe to create itself, atmospheres to form, teutonic stabilization, etc. and everything else that would have to occur before a planet could support life... It would have made more sense if he just came up with a plan that wiped out all human life and he could use the existing planets. TaoJones, I kind of agree with you, and if that is the case, it seems completely off. However, I don't imagine a collapse of the universes would mean a new big bang like the one we're familiar with, at least not with all that "the eye of the storm" stuff going on. But I suppose it's just my way of making the show somewhat fringe-believable to me. I wanted to break into the war room brain-storming scene and make a suggestion, if I understood how the Cortexiphan kids and their doubles were connecting. If they were connecting to each other, across universes, which was causing the disturbance, wouldn't Nick Lane's relocation to our universe render CortexiNick's influence powerless? Why not move all of the red universe doubles to the blue? They wouldn't have any scary powers, they have show-me trackers, and you could avoid all of the explaining by kidnapping. Even if half were moved, I doubt the electromagnetic disturbance would have enough kick. Somebody please explain to me what was going on, if I'm totally off. Something tells me none of the logic holds water this time. I'm with Josie- I feel like I should care, but the big plot doesn't make sense. The one thing I really liked, but no one has mentioned, is the contrast of rainbows and Noah's ark. In the Bible, after the flood and after the ark had safely come to rest on a mountain, the first rainbow was given as God's sign to Noah that he would never flood the whole world again. Does that mean that the red universe is at risk for a flood with the removal of the sign of promise? @wetcat, no that would not work, because the alternates still vibrate at the frequency of their home universe also when they are in the other one. Remember when Olivia could "see" this thanks to her cortexiphan-enabled abilities, and realize Peter was from out there because of the glimmer? Personally, I think Bell has been behind everything since the beginning. I look forward to seeing if I'm right (for once). I have read and reflect your thoughts on those described herein with respect to this 20th episode, “Words Apart” Josie, and I liked sincerely thank you for your post. Fringe I see is showing us only duplicate existential characters as if they had personalities of twins, but even with similar life experiences, are definitely different human beings, living places and situations that are not so well correlated. One point I see similarity in the factor emotion is intrinsic to each. The Walter and Walternate, Olivia and Fauxlivia, the alt-Astrid and Astrid, the alt-Broyles and Broyles, all of them, but Peter and Mr. Jones did not, has his alter ego in the corresponding universes. This people and their copies are different in the way they act or think, but definitely seem to me emotionally the same. Peter is what seems to be a type of person a "two" worlds, as a "universal being" similar, more or less as they are the Observers. Peter always seemed to be a kind of "key" to solving any problems that may occur in some universe of Fringe, and this comes from the time that Olivia went to Baghdad to pick it up and get to it Walter, who was admitted to the asylum. Now, in this episode, Peter was instrumental because he initiated the shutdown of the machine, to separate universes connection. When I think quickly in case of Fringe, I see that the initial action, the initiative part of Olivia, Walter in, see how to solve any problem and in general, as a means of resolution, or coming to a final action, Peter. But alongside Peter (the good), this is the “bad” Mr. Jones, or the dangerous villain of all universes. Peter, and Jones, form a dynamic duo antagonistic Fringe, which "walks" here and there, in fights against each other, in whatever place you are dimensional, I see. Until now, when Mr. Jones invests in a bad action, and Peter, one way or another evil that undoes the (great) villain. Right now, in this episode 420, Jones began a kind of "Big Bang" between universes, and Peter was there, and simply turned off the machine, and "adiós muchacho!" It is undoubtedly a kind of fight between the cat and mouse. And besides, this is a fight that does not have any idea who will win not, without the slightest idea who will win. What we know is that in the future, Peter will be immersed in a bubble of amber being saved by his daughter, Etta, but that's another story to be told better. The reality - or unreality - is now another, because we will not have interactions between the teams Fringe of the universes connected. It is each in its proper place in the corner talking or your proper frequency. Are we going to miss the presence of Walternate and his commands? Or, you may not have the Walter and his lab, is not it? The deal is expected to see. I sure hope Agent Tim's gonna be OK. Just sayin'. I may be reading too much into a Peter look, but at the end, after the separation, when Walter says that he will miss them more than he realized, Peter smiles that little smile. Does he know something? That maybe the separation isn't permanent after all? I am bummed the other universe is gone (for now). I like the faux Olivia better than the original now. Glad the series was picked up for a finale so they can finish it up right. Could Jones not be lying? The "other side" is not the alt-universe, but the Observer invasion? I didn't follow why the Fringe team thought capturing the one guy would stop the earthquakes? He was one of what, 26 people? So why all the time spent on catching the one guy and not the rest? Maybe I just missed that part, as I was flipping back a bit to watch a ball game at the same time. What can I say, I multi-task! Roberto, I think TaoJones meant to say "tectonic" instead. I too found the phrase a bit... stilted. I thought the conversation between the two Walters was especially well done in terms of technical skill. With just a couple of shots they completely threw the 'cloning-CGI-via-conspicuously-nobody-crossing-the-middle-of-the-screen' technique out the window. Which I like a lot. @wetcat. Ditto. That's what seemed the most logical to me. If they were pulling the universes together using the Cortex kids, why not release the tension by bringing them to the same universe so they were unable to pull the other universe into the "original."